Oakwood Pizza Box, Raleigh - A Slice of NYC in the Oak City! When it comes to pizza in the Triangle, Raleigh has been left a bit behind. 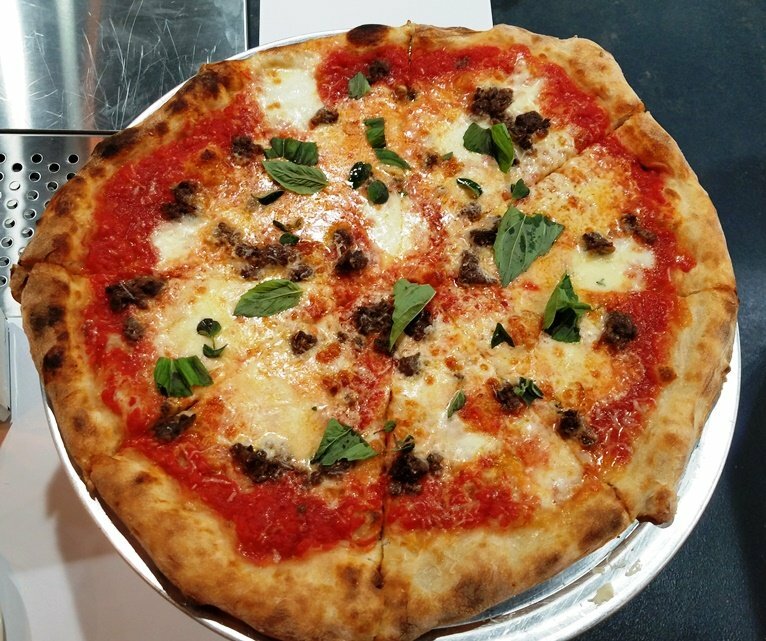 While new Neapolitan pizza joints have popped up in Durham and Cary, there haven’t been any really good spots for pizza in the Oak City which has been really disappointing for me, a self-confessed pizzaholic! But thankfully, that streak of bad luck has been broken with the opening of the Oakwood Pizza Box on Person Street. Brought to you by Anthony Guerra (formally from Bella Mia, Cary) we can now breath a bit more easily knowing we’ve got some great thin-crust za in Raleigh! 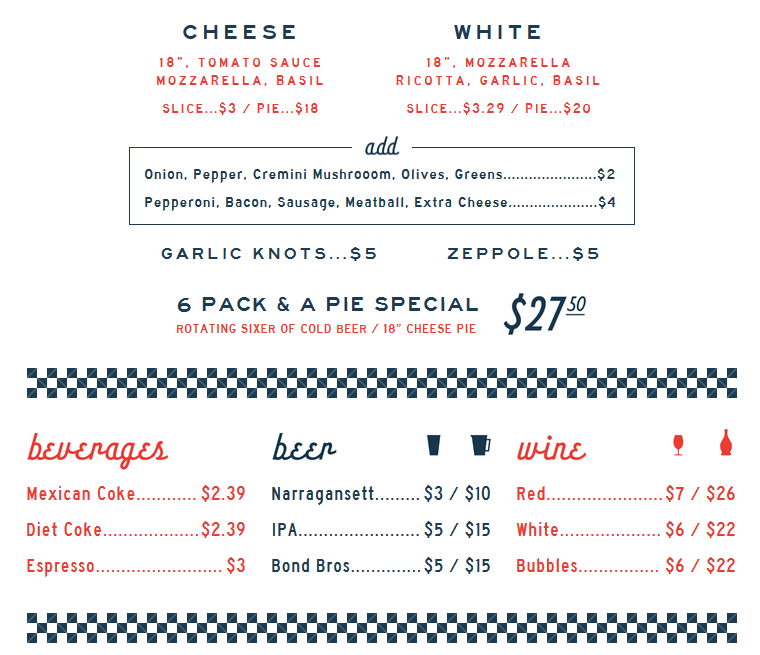 Head down to Person Street and a couple of storefronts down from the ever-popular Crawford and Sons, you’ll find the new Oakwood Pizza Box. It’s a cool little spot and has that hipster vibe that’s oh so common in Oakwood! 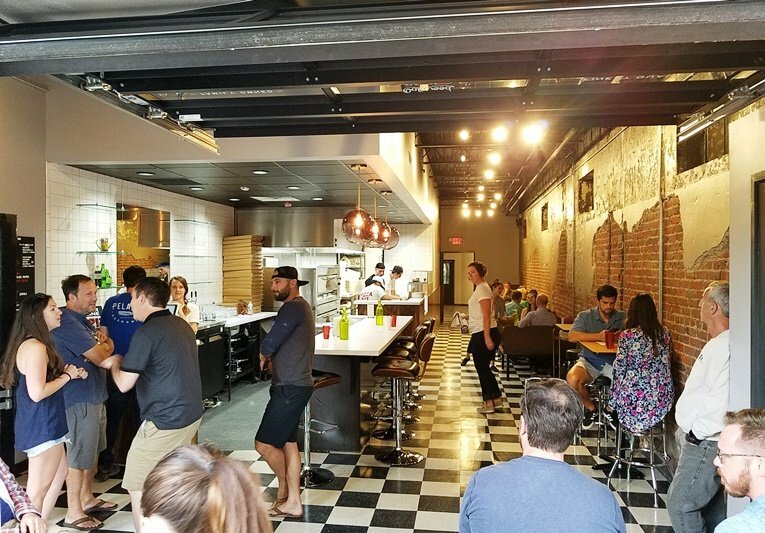 Roll-up garage door up front, black and white tile flooring, exposed brick wall and a counter for single diners. 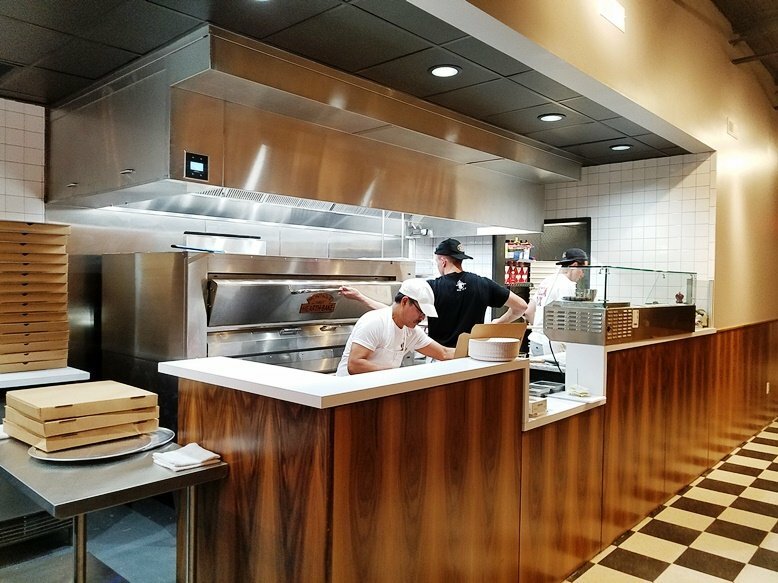 I stopped in on opening day and a week after that to get a feel for what Oakwood Pizza Box is doing and I can tell you that it’s doing pizza right! And it’s already quite popular so you might be in for a wait. Order up front at the iPad, you can do a whole pie or do it by the slice. Oakwood Pizza Box is doing 18″ pies, red and white with the usual veggies ($2) or meats ( sausage, meatball, pepperoni, bacon $4) as extras. 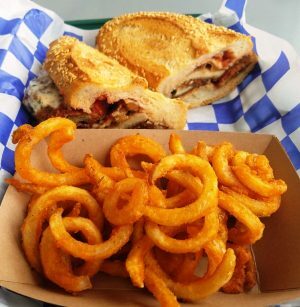 They’ve also got some some soda, beer and wine available along with garlic knots and zeppole (fried dough) for dessert but given it’s opening week, they’re doing a limited menu. I’ve had the chance to try out some garlic knots and a couple of pies so far. Given how busy it’s been during opening week, it’s about a 30 minutes plus wait for a pie but I suspect that wait times will drop a bit once they get things running smoothly and the crowds slow down. Both pies I’ve tried look great and featured excellent ingredients. Oakwood Pizza Box is doing mozzarella slices with fresh grated parmesan along with basil on their basic pie from what I can tell. The crust is baked just right in their large gas oven with a speckled char and good chewiness. The tomato sauce displays a soft and mellow tang and it complements the cheese perfectly. 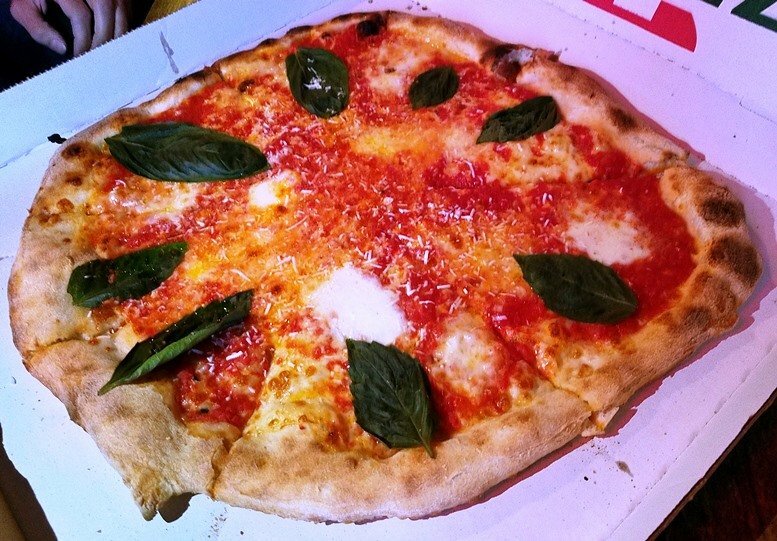 It’s an excellent NY thin-crust with great balance, the basil is a nice touch and adds some green to the flavor profile. I have to admit that I was a little embarrassed to be eating a whole sausage pie as a solo diner on my 2nd visit but I was counting on delicious leftovers! And while the 30+ minute wait can be a bit long, it’s worth it so far in my opinion! Just grab a beer, hang out and watch the locals roll in. Raleigh had been left out of the current pizza renaissance in the Triangle so I’m so happy to have Pizza Box here and in downtown Raleigh. It reminds me a lot of what Pie Pushers is to Durham. 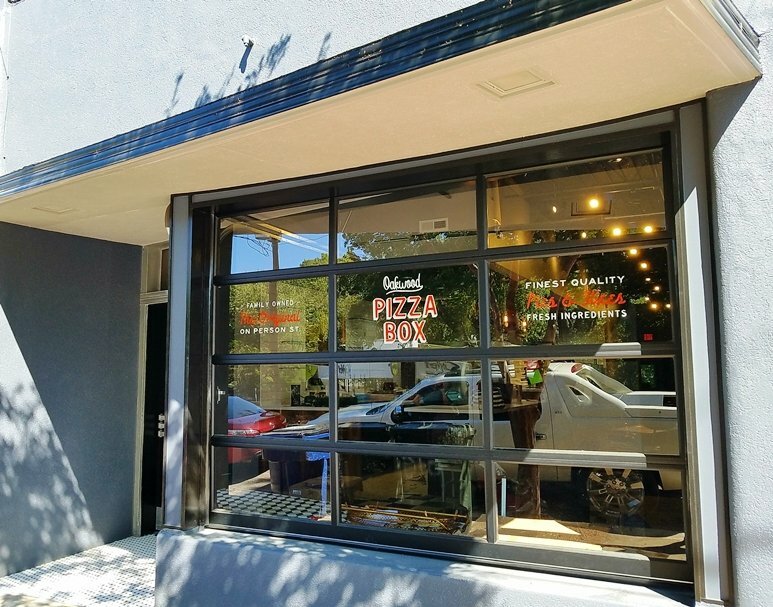 A casual neighborhood pizza joint that’s offering up a delicious slice for the discerning public. 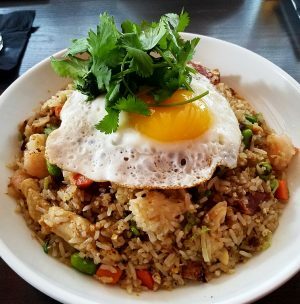 And that’s high praise indeed, given the competitive nature of the Triangle food scene. So rock on Oakwood Pizza Box! I’ll be back soon, maybe not for a whole pie but a couple of slices along with some zeppole for dessert, too!